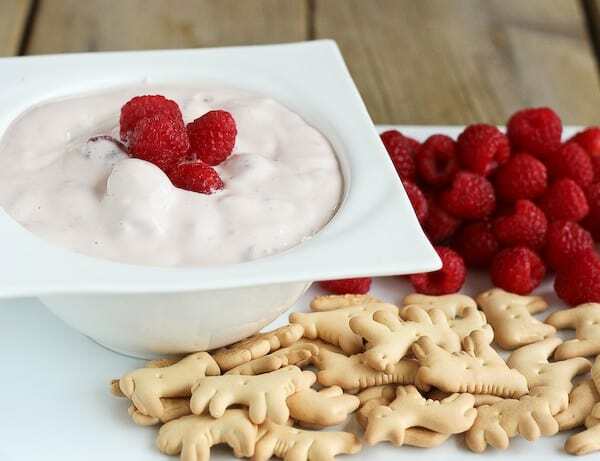 This raspberry cheesecake yogurt dip is a great summertime treat and perfect for dunking fruit, crackers, or cookies into it. I just love, love, love the fact that it is finally getting to be berry season! Berries in particular remind me of fond childhood memories. As a child, we would always go pick berries with my whole family. Mainly strawberries and blueberries. I remember our buckets filling up with sweet, juicy, fresh berries. It doesn’t get much better. Raspberries hold an extra special place in my heart because those we would pick in grandpa and grandma’s back yard. I remember heading over to my grandparents’ house and going out to their backyard garden. We’d fight the bumblebees (they also loved those raspberry bushes!) for handfuls of sweet red raspberries. That house is up for sale now and the garden is empty but I am so grateful for those memories — as well as many more. My grandparents lived in that house for 60 years. Can you imagine all the raspberries picked in that length of time? As a family, now just speaking of our family of four, we rarely eat dessert after dinner. However, we always have a bowl of plain fruit and I’m so thankful the roster again includes raspberries and other berries. However, that doesn’t mean we never have a sweet treat in the house. 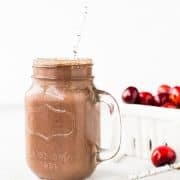 And I love treats that are a bit indulgent but don’t leave you feeling weighed down and regretful of what you just ate. To me, that takes away from the joy that dessert gives. A dessert loaded with fresh berries yields a lighter, more satisfying dessert. So you can head back out and enjoy the sunshine with family and friends instead of feeling like you need to take a long nap. When Driscoll’s challenged me to create a recipe using their raspberries, I knew I wanted something that would fit the description. Lighter than a heavy chocolate fudge cake (nothing wrong with that every so often!) but every bit as satisfying. This cheesecake yogurt dip fits the bill. Filled with fresh raspberry purée, whole raspberries, reduced-fat cream cheese, and plain Greek yogurt, it is satisfying, fresh, and good enough to eat off a spoon. 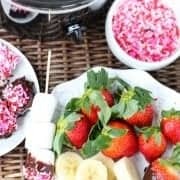 If you don’t have a spoon handy, or you don’t have a fairly big item to dip into the dip, I’d recommend mashing the whole berries slightly before including them in this dip. They can be a little hard to fish out if you’re just dipping in more raspberries. But it’s nothing a spoon can’t fix. Seriously, this is good enough to eat off a spoon and really it’s similar to a really indulgent Greek yogurt. It’s still healthier than eating a bowl of ice cream. So I say grab a spoon and dig in. But this yogurt dip would be phenomenal at a summer picnic or party too — I’m absolutely positive this bowl with be empty before any of the others on the buffet table. 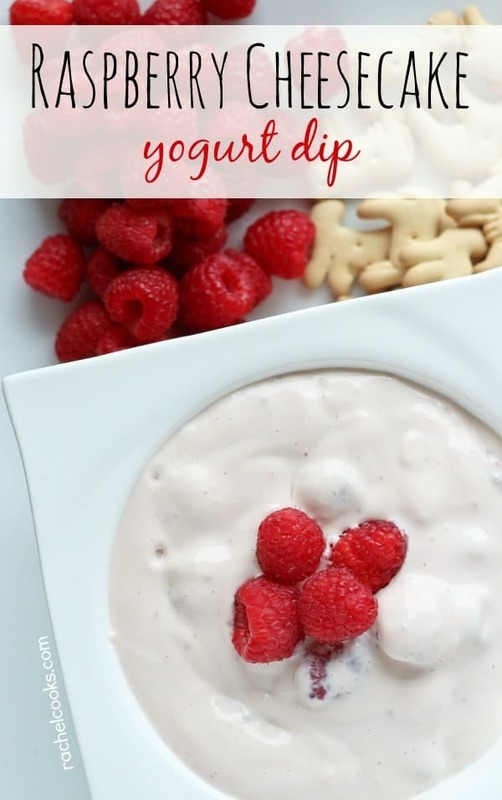 This raspberry cheesecake yogurt dip is a great summer time treat and perfect for dunking fruit, crackers, or cookies into it. 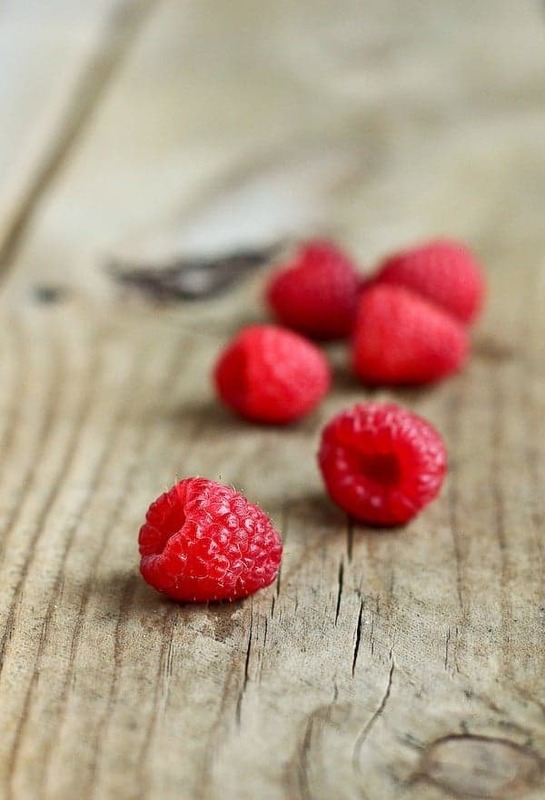 In a small bowl, mash 1 package or 6 ounces (1 and 1/4 cup) of Driscoll’s raspberries with a fork. 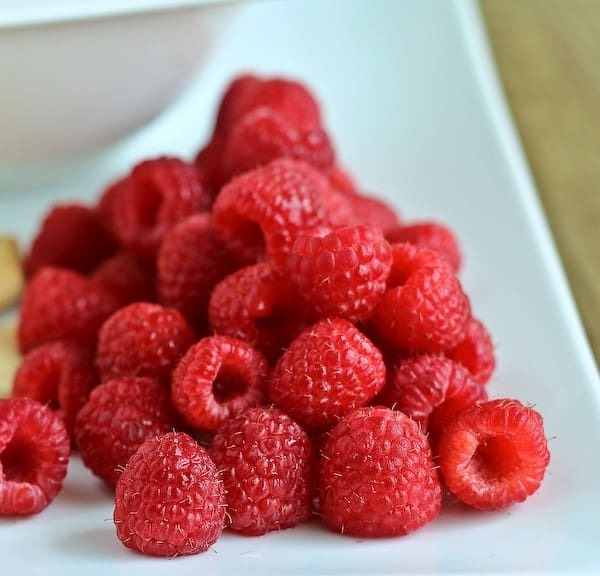 Place a fine mesh strainer over a blender and push the mashed raspberries through the strainer using a spoon. The seeds should stay in the strainer and the mashed raspberries should be in the blender. To the blender, add cream cheese, yogurt, brown sugar and vanilla. Blend briefly until smooth and combined. 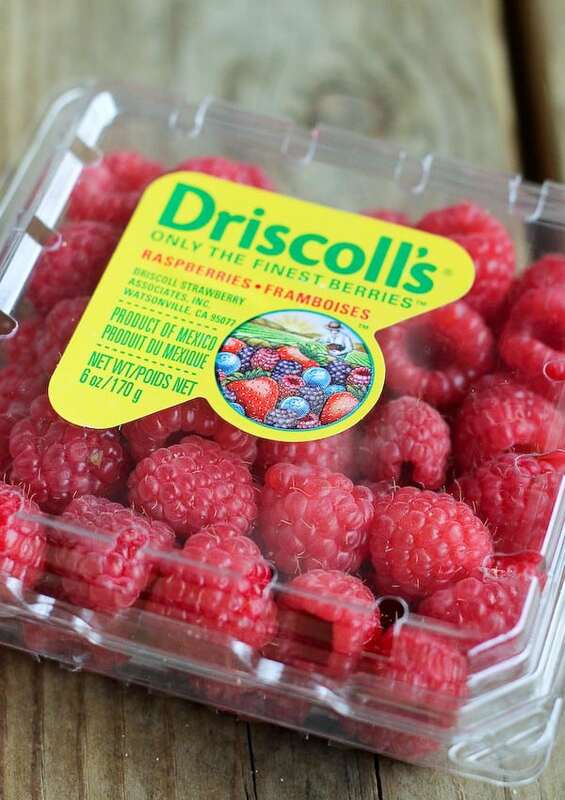 Transfer to a bowl and fold in the remaining whole Driscoll’s raspberries (1 package or 6 ounces or 1 and 1/4 cups). Store covered in the fridge or serve immediately with raspberries, graham crackers or animal crackers for serving. Verdict: I loved this. As you already know, since I discussed the spoon situation. 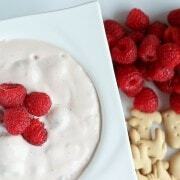 Husband’s take: He loved, loved, loved this cheesecake yogurt dip. So did the kids! Want more great raspberry recipes? Head on over to Driscoll’s to find them! 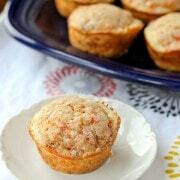 Disclosure: Paid Endorsement from Driscoll’s – Visit www.driscolls.com for more berry recipes. I was compensated for my time and my recipe development. All opinions are my own, as always. It’s probably been a summer or two since I’ve picked fresh raspberries, so I usually do end up with Driscoll’s from the store (which works just as well!) Cheesecake is one of my favorite desserts, so I can’t wait to dive into this dip. Hay what a cute idea! Such a great memory of picking raspberries in your grandparents backyard. My grandparents also had raspberry bushes and my sister and I would pick them and eat them by the handfuls when we were kids. I love this dip! Such a great way to eat something decadent tasting like cheesecake yet keep it healthy with Greek yogurt! Pinned! My kids will go cray for this dip! So so good! YUM! 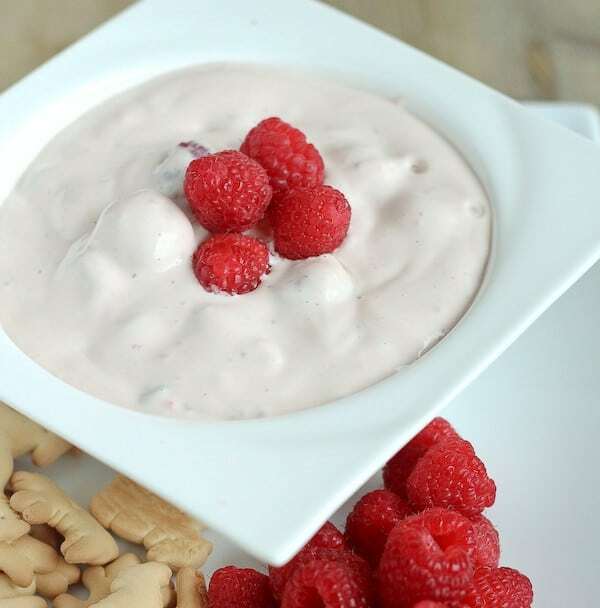 I love raspberries…and cheesecake, of course, this dip sounds SO delicious! This looks like pure perfection! I’ve always loved raspberries, but for some reason this year, I love them more than ever! Gorgeous and yummy I’m sure. Love raspberry season. It just makes me crazy that we can’t enjoy these all year without paying out the wazoo but I’ll enjoy ’em while they’re cheaper. Yum! This dip sounds perfect for snacking or entertaining!